Live scores and updates of the IPL 7 match between Royal Challengers Bangalore and Mumbai Indians. FirstpostGlenn Maxwell produced a breath-taking display of power hitting to demolish the Chennai Super Kings bowling attack and help his side chase down 206 to win their opening game against the perennial title contenders. After a high scoring match, the evening match turned out to be a low scoring thriller as Rajasthan Royals edged out Sunrisers Hyderabad to start off on a winning note. 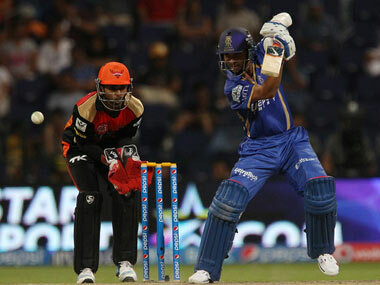 FirstpostRahane and Binny played gritty innings as Rajasthan beat Sunrisers Hyderabad by four wickets. After playing a crucial role in helping Rajasthan Royals outclass Sunrisers Hyderabad, RR all-rounder Rajat Bhatia Rajat says he is relishing the prospect of shouldering a "more responsible" role with his new franchise. FirstpostRajat Bhatia says he is relishing the prospect of shouldering a more responsible role with Rajasthan Royals. FirstpostDavid Miller wants to imbibe the courage of conviction from his new teammate Virender Sehwag while sharing the dressing room with the veteran Indian cricketer. Breaking: Chris Gayle misses out of this game too, Kohli says that he would be fit for the next one though! RCB have won the toss and elected to field. RCB have gone with an unchanged side. Rohit Sharma says that they would have fielded first too as the track might not change much. MI XI: M Hussey, A Tare, A Rayudu, R Sharma, K Pollard, C Anderson, Harbhajan Singh, P Ojha, Z Khan, S Malinga, J Bumrah. RCB XI: P Patel, N Maddinson, V Kohli, Yuvraj Singh, AB de Villiers, A Morkel, S Rana, A Dinda, M Starc, Y Chahal, V Aaron. One change for Mumbai Indians as CM Gautam is replaced by Jaspreet Bumrah. Right then! The players have made their way out in the middle. Michael Hussey and Aditya Tare are the openers. Mitchell Starc will start off proceedings for RCB. Both the MI openers are off the mark straightaway! DROPPED! Chahal drops Hussey! Full outside off, Hussey comes forward and drives it uppishly straight to point where Chahal drops a sitter. Chahal is straightaway banished to mid off. FOUR! Not too convincing. Hussey cuts it uppishly over cover-point for the first boundary of the innings. 8 runs off the first over. Albie Morkel will bowl from the other end. OH BOY! Another drop! Full outside off, swinging away. Tare looks to drive but gets an outside edge to first slip where Maddinson drops a dolly. Both batsmen dropped now! Beaten! Albie Morkel is bowling beautifully, beats Hussey with an outswinger. It's a good over, just two runs off it, 10/0 after 2! Play and a miss from Hussey! Dances down the track and looks to loft it over mid off but is beaten by the away movement. FOUR! Lovely! Hussey comes forward and drives it crisply through covers, it races away. Tare goes for a booming drive off Starc but misses it. Another play and a miss! This one snakes off the surface after landing on a back of a length area. Tare looks to pull but misses. 7 runs off the 3rd over. Ah! Terrific stuff from Albie Morkel, After brilliant outswingers, he brings this one back in, Tare is cramped for room on his cut and misses. NO BALL! Morkel clips the bails off at the non-striker's end while delivering the ball, it's short and wide outside off, Tare mistimes his punch to cover. change of pace now! He's trying out everything, good stuff from Morkel, Hussey whizzes down the track for a heave but is foxed by the change of pace, misses! FOUR! Uppish but in the gap! Maddinson cuts it wide of point, RCB are away. Beauty from Zaheer! Nips away after landing outside off, Parthiv feels for it and misses. 7 runs off the first over. Harbhajan Singh into the attack now. Maddinson goes back and dabs it wide of short third man, Zaheer chases and just about flicks it back inside. Saves a run. Short outside off, Patel cuts it to point, the fielder does well to make the stop. 4 runs off the Harbhajan over - RCB 11/0 after 2 overs. Lasith Malinga into the attack now. Nicely bowled slower one, a yorker on off, Maddnson digs it back to the bowler. FOUR! Maddinson looks to drive but gets an outside edge to third man. Lucky boundary. Mumbai need more of these! Virat Kohli is the new batsman. In the air but safe. Patel slashes but gets an outside edge which falls short of third man. There is some hope for Mumbai Indians! DROPPED! Tare the culprit! Back of a length delivery outside off, Yuvraj pokes at it and gets an outside edge, Tare leaps in the air and fluffs it! It could have been two in two for Zaheer! !